Tonight Richard and I are planning to watch a favorite movie classic, “Dr. Zhivago”, and I wanted some treats to complement the movie. We’re looking for comfort to get us through another wintry March evening and a bottle of Stolichnaya Pepper Vodka is tempting. Yet thrashing back shots of vodka doesn’t seem a wise idea, especially mid-week. Red beet borscht sounds like a much healthier alternative. After all, this classic Eastern European soup sustained families across Russia, Romania and the Ukraine for generations through seemingly endless, cold winters. With it’s saturated, jewel-like colors, beets are the glistening rubies in the crown of root vegetables. I selected dark red beets for tonight’s borchst. Historically, borscht was made with beef stew meat, homemade beef stock and served hot. It’s wonderful, as well, served as a chilled, puréed summer soup, eggs are sometimes used to thicken the mixture. It’s a long movie so I need to cut the prep time, taking shortcuts with my interpretation. Instead of boiling beef for the stock and soup, I’m using beef broth. To save additional time, you could purchase pre-cooked beets. I enjoy the earthiness of fresh beets, but the Melissa’s brand available in the refrigerated produce section of Trader Joe’s or Whole Foods is good. I prefer the flavors of all of the vegetables, en masse, so puréed the soup and served it hot. The puréed version is good comfort food, as well, with the texture reminiscent of mashed potatoes. If you prefer, pulse just a few times for a coarse, yet emulsified, texture. How I yearn to complain about the “Dog Days of Summer”; how I yearn to sweat under a hot summer sun. One day at a time, I tell myself. One shovel of snow closer to Spring. 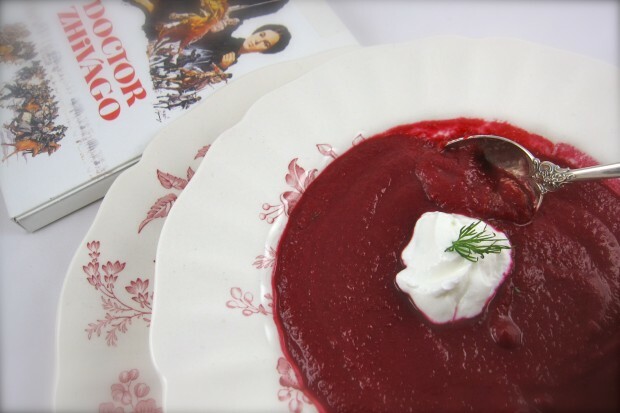 In the meantime, there’s always Borscht and Dr. Zhivago, both excellent enjoyed with good dark bread. In a Dutch oven or heavy-bottomed pot over low heat, heat olive oil. Stir in beets and tomato paste and sauté, with a pinch of kosher salt, 15 minutes. 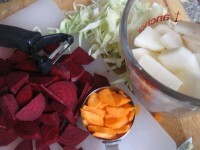 Stir in onion and carrots and sauté until beets can be pierced with a fork, an additional 15-25 minutes. Stir in potatoes, cabbage and stock and bring to a boil. Reduce heat to low and simmer until beets are very tender. In a food processor or with an immersion blender, pureé soup. Season to taste with kosher salt, if needed, and freshly ground pepper. Spoon into individual bowls; garnish with dollops of sour cream and dill sprigs.